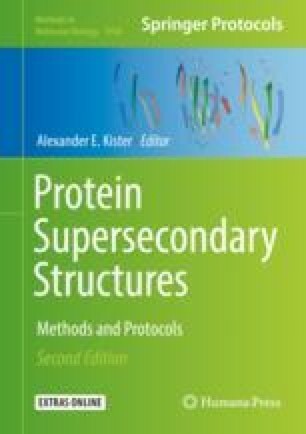 We will consider in this chapter supersecondary structures (SSS) as a set of secondary structure elements (SSEs) found in protein domains. Some SSS arrangements/topologies have been consistently observed within known tertiary structural domains. We use them in the context of repeating supersecondary structures that self-assemble in a symmetric arrangement to form a domain. We call them protodomains (or protofolds). Protodomains are some of the most interesting and insightful SSSs. Within a given 3D protein domain/fold, recognizing such sets may give insights into a possible evolutionary process of duplication, fusion, and coevolution of these protodomains, pointing to possible original protogenes. On protein folding itself, pseudosymmetric domains may point to a “directed” assembly of pseudosymmetric protodomains, directed by the only fact that they are tethered together in a protein chain. On function, tertiary functional sites often occur at protodomain interfaces, as they often occur at domain-domain interfaces in quaternary arrangements. First, we will briefly review some lessons learned from a previously published census of pseudosymmetry in protein domains (Myers-Turnbull, D. et al., J Mol Biol. 426:2255–2268, 2014) to introduce protodomains/protofolds. We will observe that the most abundant and diversified folds, or superfolds, in the currently known protein structure universe are indeed pseudosymmetric. Then, we will learn by example and select a few domain representatives of important pseudosymmetric folds and chief among them the immunoglobulin (Ig) fold and go over a pseudosymmetry supersecondary structure (protodomain) analysis in tertiary and quaternary structures. We will point to currently available software tools to help in identifying pseudosymmetry, delineating protodomains, and see how the study of pseudosymmetry and the underlying supersecondary structures can enrich a structural analysis. This should potentially help in protein engineering, especially in the development of biologics and immunoengineering. The online version of this chapter ( https://doi.org/10.1007/978-1-4939-9161-7_10) contains supplementary material, which is available to authorized users. I would like to thank Jiyao Wang at NCBI who developed most of iCn3D software and has been working very hard to release the new version of the software to allow some key visualization on time for this paper and all members of the NCBI Structure group headed by Steve Bryant who participated; Peter Rose at SDSC who guided me through RCSB’s symmetry categorizations in quaternary structure and who developed the symmetry visualization in Jmol, used at RCSB and within CE-symm; and Spencer Bliven and Aleix Latifa who developed CE-symm further to allow multilevel symmetry determination, both at the quaternary and tertiary levels simultaneously. A special thought for Guido Capitani who supported that last effort and who passed away last year, far too young, before we had time to join forces on tertiary/quaternary structural analysis. I miss him both at a personal level and scientifically. Thank you to Stella Veretnik for discussions over the years on small beta barrels. Thank you to Phil Bourne who gave me the opportunity to resume work on pseudosymmetry at the NIH while initiated long ago at Columbia University with Cy Levinthal, Barry Honig, and Wayne Hendrickson. Thank you to Tom Misteli at the National Cancer Institute for his support, giving me the opportunity to pursue applications of these concepts in the aim of developing rational design methods for immunotherapy. Finally, I would like to thank Mitchell Ho at the NCI for introducing me to Shark Immunoglobulins. This research was supported in part by the Intramural Research Program of the National Cancer Institute and the National Library of Medicine, NIH.